No background! Decal is the shape of the design with holes cut out. Up to 100 inches in size! Custom color/material choices like chrome and carbon fiber. Works great on windows where you need to see through open areas of the design. Click Here or the image above to get a quote FAST! Can be made in ANY SHAPE! Holes can be cut out of some open areas if needed. Full color using CMYK inks results in photo quality prints. Any size you want from 0.2 inch to 100 inches in ANY sizing increments. Lots of material and finishes available. We have 1000's of custom patterns or you can use your own to fill in the design. Making custom decals since 2001! Many of the decals that you see on the site started out as custom decals. No job is too small or too large. If you need just 1 custom decal or 100,000 custom decals, we can help. 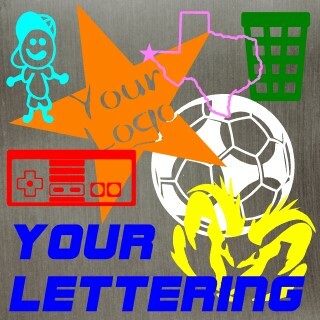 Email us for a custom quote on decals made exactly to your specifications. Full digital printing available for small or large runs of custom decals. Single color die-cut custom decals are of coarse available too. We accept just about all types of image formats to work with (vector art preferred). We give HUGE discounts too on bulk orders of custom decals. 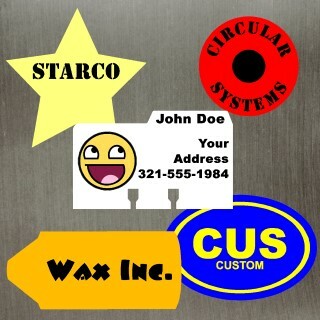 Pricing can be as little as 10 cents per decal when purchasing in bulk. Or see all of our Custom Decals you may purchase directly online. Below are product we offer in bulk (normally a 125 quantity minimum) for HUGE discounts. 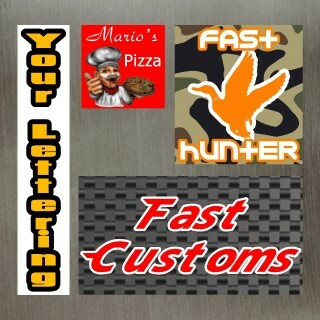 Get started on a custom decal quote for any of the items listed below.